The island city of Mumbai nestled in the Arabian Sea is India’s leading industrial, educational and tourist hub. The history of this cosmopolitan city dates back to the 16th century, when Vasco da Gama, a Portuguese explorer christened the city Bom Baia, denoting ‘Good Bay’. The Portuguese ruler gifted this group of seven islands to Charles II of England, who subsequently leased these to the East India Company in the 18th century. The British made the city their headquarters for trading and renamed it as Bombay. This era saw the development of monuments, offices, railways and the famous Bombay Stock Exchange came into existence. The British ruled India for over 200 years, finally setting sail for Europe on 15th August, 1947; and the Government of India made Bombay the capital of Maharashtra. The 19th and early 20th century, saw an increase in small scale craftsmanship and very soon Bombay became famous for its flourishing textile industry. With the event of modernisation, in the 21st century, railways, airports, malls, banquet halls, theatres all wove their way into Bombay, now popularly known as Mumbai. Mumbai is currently the most populour city in India, home to people of diverse religious and cultural backgrounds. The latest historic additions are the ‘Bandra Worli Sea-link’ and the ‘Eastern Freeway’ which stretches 16.8km long, linking the Northern suburbs to the island city. The city is renowned for its unique, one of a kind ‘Queen’s necklace’ that dots the city’s skyline at night; besides several historic landmarks such as the ‘Gateway of India’, ‘Prince of Wales Museum’, ‘Chowpatty’, ‘Hanging Gardens’ and ‘Juhu beach’. The incredible city of Mumbai is a true melting pot, bringing together people from all parts of the country, as well as from the subcontinent and expatriate communities from across the world. It is the city that never sleeps, and the entertainment and financial hub of the county. In Mumbai one sees the many faceted aspects of India- the cultural diversity, the heritage precincts, the abiding love-affair with food, the passion for festivals and cricket in equal measure, bazaars and markets spanning from the largest flea market to the swish malls, skyscrapers and slums sitting cheek by jowl. Come and explore Mumbai’s madness in its truest hues!! Mumbai, the capital of the state of Maharashtra, nestled between the Arabian sea and the Sahyadri Mountain range is close to many tourist destinations- either a car/train journey away or a short flight distance away. We have listed some suggestions below for a 2-3 day trip. Located near Aurangabad in Maharashtra are designated as World Heritage sites and have Buddhist and Hindu rock paintings that date as far back as the 2nd Century B.C. These caves are a must see and are carved into the side of a cliff. The elaborate architectural carving and murals in these caves represent an era of Indian history that is best preserved and represented at these sites. Alternatively a flight to Aurangabad from Mumbai and then transfer by car to the cave sites. Just a 45 minute ferry ride away from the Gateway of India in Mumbai are the sleepy, fishing villages of Mandwa, Alibaug and Murud Janjira. Recently these have also been invaded by harried city folk seeking a break from the fast-paced life of hustling and bustling Mumbai. Murud Janjira is a fort located on an island off the coast of Murud. These locations would be ideal for an overnight or 2-3 day trip. Below are links for Ferry information and possible locations to book a stay. Mango resorts: Boutique hotels/homestays near the Kihim beach and Alibaug beach. Tropicana resorts: A Boutique hotel with rooms and villa bookings. 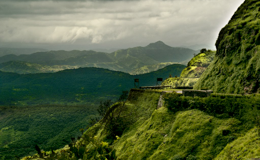 A two drive from Mumbai are the hill stations of Khandala and Lonavala. From here one can explore the beauty of the Sahyadri Mountain range and also hop over to Pune, the Cultural capital of Maharashtra, for a tour of its old-fashioned streets, markets and homes (wadas). Machan- a luxury eco-resort with tree houses that gives you a live experience of the rich canopy of the Sahyadri. It is located in a biological hotspot, Jambuline, a 2.5 hour drive from Mumbai. It also serves as an excellent base from which to trek to the forts that nestle atop the glorious Sahyadri peaks and represent the history of the Maratha rulers of the state. www.machan.com. It is Maharashtra’s most popular hill station with soaring peaks and breath-taking valleys. A short drive from the town brings you to the beautiful Venna lake and Panchgani hills. The state of Goa is a tourist paradise with its unique history, scenic beauty, beaches and architectural splendors. It can be reached by a short 45 min flight from Mumbai.